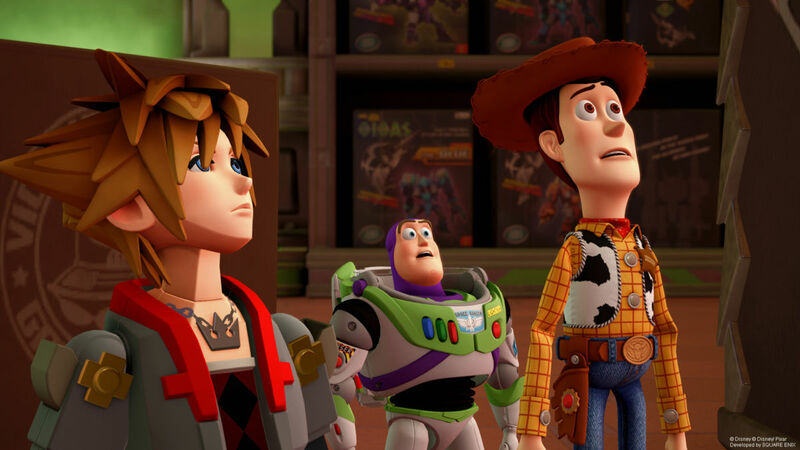 The Kingdom Hearts 3 flans can be a bit of a pain, so we've tracked them down and how to beat them. The Flantastic Seven are a collection of unique Heartless scattered throughout the seven Disney worlds. Each Flan has a different fruit atop its head and when interacted with using the “Boinnng!” command, they will challenge you to a unique mini-game. Beating the high score of each game will net you three of that Flans fruits and also a new ability. Setting a new high score on each one of the Flantastic Seven will reward you with the Flanniversary Badge accessory. You’ll also be gifted one of the rare Orichalcum+ synthesis material pieces needed to craft the Ultima Weapon. This guide will tell you exactly where to find each Flan and what score you’ll need to beat it. Land at the Overlook point in Thebes and from there head all the way to the top of the stairs where you’ll find the Cherry Flan waiting. One of the trickier challenges, this mini-game involves hitting into as many Flans as possible as you use Goofy’s shield to Trinity Slide through Thebes. You will have to aim to hit the speed boost arrows to have a shot at racking up a decent score. It’s worth noting that the speed boosts also change your direction (usually towards more Flans) so avoid moving the analogue stick until after your clear of them. Head to Rapunzel’s Tower in The Forest and after you load in turn around and leave the area through the passage. As soon as you exit through the vines you’ll see the Orange Flan. For this mini-game, you have to take seven “Excellent” pictures of the different Flans in the area. There’s no time limit on this one and there are more than seven Flans that you can photograph, so take your time and wait for each Flan to strike a pose as you aim the camera at them. I’d avoid any that are walking around because these can be difficult to time correctly. Focus on the Flans that are chasing butterflies for some easy snaps. Load in at the Galaxy Toys Rest Area and you’ll see the Strawberry Flan straight ahead of you in front of some vending machines. This one’s pretty easy. Knock into as many Flans as possible and they will all stack up on top of you as you spin around in a teacup. The Flans that are rolling around on strawberries will try to knock them off, but these are easily avoided by pressing the X button to slide out of the way. Choose the Basement area of The Factory to load into. From loading in, turn to your right and enter the plain white door leaning against the wall to take you into The Door Vault. Follow the passage this opens into until you face a wall covered with doors. You need to head through the brown door on the far left. This takes you out onto a platform where you can find the Banana Flan. Avoid the big Flan in the middle and hit the little Flans to gain points. This one can be difficult, but if you equip Thundaga and an Elixir to the shortcut menu, you can easily use the spell to rack up a high enough score. Just focus on dodging the bigger Flan and cast Thundaga when you can. Land at The North Mountain Ridge and next to the Moogle Shop at the side of the cliff you should find a gust of wind to propel you up. Do this and then skydive down to the next level where the Grape Flan is. Pretty similar to the last one except it doesn’t matter too much if you get hit by any of the Flans. You can use the same method of Thundaga + Elixir to clear the Grape Flans out quickly and get the required score. If you block against their attacks, you can redirect them and earn more points than from destroying them by other means. Spawn at the Port Royal Fort and head out into the courtyard where you’ll find this flan. As the Flans approach Port Royal, you have to use the cannons to destroy them before they get too close. You can hit the bell in the middle of the cannons to clear out all of the Flans on the screen but this has a short cooldown afterwards. There shouldn’t be much difficulty here. Make sure you choose the South District: Night loading point; the Honeydew Flan doesn’t spawn in the daytime. From here, climb the building behind you and then head to the top of the tall building with the red Eiffel Tower-looking structure on top. You’ll easily spot the Flan on the building adjacent to this. Simply bounce on the top of the Flans and rack up a high enough score. After you reach a total score around 9,000, the skydiving mechanic is introduced which makes you fall a little faster and you’ll have to be slightly more accurate, but this shouldn’t cause much of a problem. Please read more of my articles so I get paid more. Spends too much money on video games. Experience Goofy's face in terrifying three dimensions.